HR Leaders understand the most complex organizational changes can open the door to new possibilities. As the world’s leader in endto- end gaming technology, IGT saw a merger as an opportunity to re-imagine their global HR processes and supporting systems to deliver personalized, relevant HR services to employees in over 60 countries. 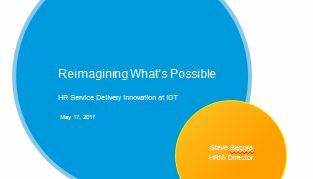 In this session, hear the story of IGT’s ongoing journey to consolidate processes, systems, cultures, and service delivery models after a corporate merger. Key themes include: M&A HR Transformation, HR automation, HR self-service, HR innovation and more!